The aim of this capital expenditure model, sometimes referred to as the capex model or capital plan, is to accumulate the relevant capital expenditures for the business by year. In the financial projections template, capital expenditure is shown in the cash flow statement under the heading of investing activities, as amounts paid for long term assets. Although in the template the capital expenditure is shown as one lump sum, for ease of accumulating the information, it is probably best to use this capital expenditure model to review the capital needs in detail by department or function. To develop the capital plan you must think through the capital purchase requirements for each area of the business. The capital plan should be consistent with the with the rest of the financial projection. For example, if you plan to increase sales and marketing staff, there should be a corresponding increase in capital expenditure on computers and office furniture. Likewise, if you plan to increase production, there should be an increase in machinery and manufacturing capacity. Capital expenditure is the amount spent on long term assets expected to last for more than one year. For example the cost of a computer is capital expenditure included in the balance sheet, whereas the cost of the electricity to run the computer is an expense included in the income statement. All long term assets have a useful life, and part of the cost of the asset is written off each year to the income statement as an expense. In the financial projections template, this expense can be seen in the income statement under the heading of depreciation. The value of the asset shown in the balance sheet (known as the net book value or NBV) is reduced by the amount of the depreciation expense for the year. The type of costs to include will vary from business to business but can generally be separated into land and buildings, plant and equipment, furniture and fittings, computers, and motor vehicles. The purpose of this capital expenditure model is to help you accumulate the relevant costs in detail and summarize them ready for inclusion in the financial projections template. Enter a description for the capital expenditure item such as LAN server or motor vehicle etc. For each item enter the number of units purchased. For example if twenty computers are purchased enter 20. Enter the unit cost of each item. In the above example, if each computer costs 1,500, enter 1500. The capital expenditure model will calculate the total cost by multiplying the quantity by the unit cost. In the example used here, this would be 30,000 (20 x 1,500). Enter the year in which the asset is purchased. If the asset forms part of the opening balance sheet enter 0. If the year column entry is left blank, the capital expenditure model will automatically allocate the expenditure under the opening column. Likewise, if the asset was purchased in year 1 enter 1, year 2 enter 2, and so on. Each asset line can only be allocated to one year. Once these details have been entered the capital expenditure model allocates the expenditure to the correct year. Finally, the model calculates the total capital expenditure for each of the 5 years. The amount calculated under the opening column should be included in the opening column on the balance sheet of the financial projections template, on the line headed long term assets. Alternatively, if the start-up costs calculator is being used, the amount can be included on that calculator under the long term assets heading. The amounts calculated for each of the five years (1-5) should now be included under the heading of amount paid for long term assets on the cash flow statement of the financial projections template. Our capital expenditure model is available for download in Excel format using the link below. Users use this capital expenditure model at their own risk. We make no warranty or representation as to its accuracy and we are covered by the terms of our legal disclaimer, which you are deemed to have read. 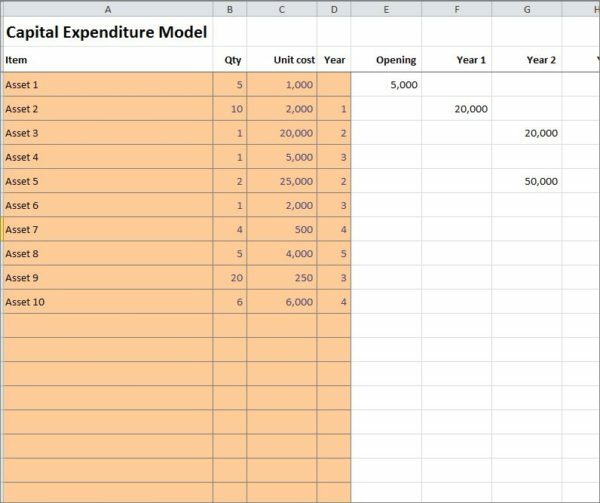 This is an example of a capital expenditure template that you might use when preparing financial models in Excel. It is purely illustrative of a business plan financial model. This is not intended to reflect general standards or targets for any particular company or sector. If you do spot a mistake in this capital spending model, please let us know and we will try to fix it.